Love Reese’s peanut butter cups but not the corn syrup solids, nonfat milk and tertiary butylhydroquinone on the ingredient list? Yeah, me too. This real food version is super simple to make and tastes even better than the original . . . just ask my kids. 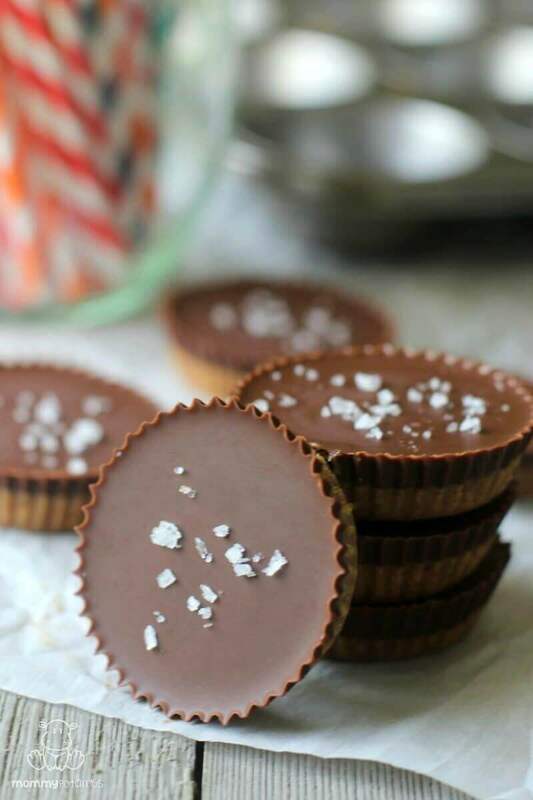 If you’ve never tried it before, I highly recommend sprinkling the chocolate with a pinch of salt – it really makes the flavor pop! I used this delicious Makai Deep Sea Salt that was given to me as a gift. In a small bowl, combine almond butter, 2 tablespoons coconut oil and maple syrup. Stir with a fork until well-combined and then pour 1 tablespoon into 8 muffin cups that have been lined with parchment paper cups. Place the muffin tin in the freezer for 10 minutes. After the first layer has been in the freezer for about 10 minutes, begin warming the chocolate chips and 3 tablespoons of coconut oil over low heat. When melted, remove the muffin tin from the freezer and place a tablespoon of the chocolate mixture into each cup. You may have a little left over after doing this - if that's the case, just divide the remaining liquid between the cups. Place the muffin tin back in the freezer and allow it to harden for at least 20 minutes, then sprinkle with salt and serve. If the cups have been in for several days or weeks, you may want to allow them to warm for a few minutes before eating. Enjoy! This recipe was adapted from one that Katja of The Savory Lotus graciously shared with us a few years ago. 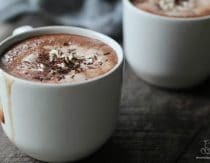 If you’re looking for her recipe – which incorporates more almond butter and a little less chocolate – you can find it below. Want more real food versions of childhood favorites? Here are a few that I love . . .
Haha! Thanks for the laugh! Looks fantastic – I may have to sample tese while the kids are sleeping! Just made! So delicious and so quick! Yes, but you could use another nut butter if you’d like! So trying this recipe today! These look great! Do you measure the coconut oil as a solid or after melting? Thank you for yet another awesome recipe that keeps my Husband thinking I am Super Woman! I tried these last night, and they’re delicious. Thanks for sharing the recipe! Sista, I thinks I love you! My little guy is severely allergic to peanuts. I wanted so bad to give him a peanut butter cup since they are soooo yummy… Thanks for giving me an alternative to give to him! Just made them, delicious and easy! 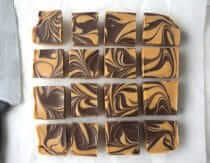 The almond butter ended up being softer than the chocolate, so next time I may try putting the chocolate on the outside. Made a double batch! Could you make these with clarified butter instead of coconut oil? Coconut oil makes me gag! 🙂 Thanks. Thanks for sharing! I love your website! Pinning this guest recipe! 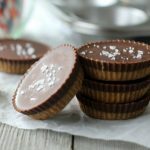 I tried this and the coconut was too strong while the chocolate was bitter tasting. My kids hated this. I was so hoping to like this, as I am looking to eat healthier. Stephen Richardson thought you’d enjoy this! This way my peanut allergic husband can eat them! Thank you! I love your page but I’m allergic to tree nuts and coconuts, items you use often. Do you have any ideas for substitutes? I’m not allergic to peanuts so I can use they in place of almond butter. I’ve made these many times and we DEVOUR them! Grade B maple syrup? Does it make a difference? I was reading the comments below this recipe and it said that you can use any nut butter, so peanut butter it is! Jessica Nava – Substitution options will vary from recipe to recipe so I don’t think I can give a general recommendation. Glad you can use peanut butter, though! How much effort do these involve? Is it worth it? I’ve made these! I used peanut butter though, bc that’s what I had on hand! They were so good! And I’m craving cookies now…maybe I’ll just make these! I can’t even pronounce those ingredients !!! Can sun butter be used? I know these are “healthy” but how many calories? i think I might make some of these for my Dad for Christmas. Cynthia Gomez this is a good blog for healthy recipes. Jill Schumacher maybe you can make these too. We can have taste tests! Sounds good! And healthy too. Must make some!! I’ve made these several times and they are beyond FABULOUS!!! Jacqui – I’m already all over these. Made myself some dairy grain gluten sugar free peanut choc cups the other day! Ooohh bliss!! these look amazing and I can’t wait to try them. thank you so much for adapting my favorite candy to a healthier version. love the salty and sweet! looks amazing. I have a weakness for reese…. OMGOSH! 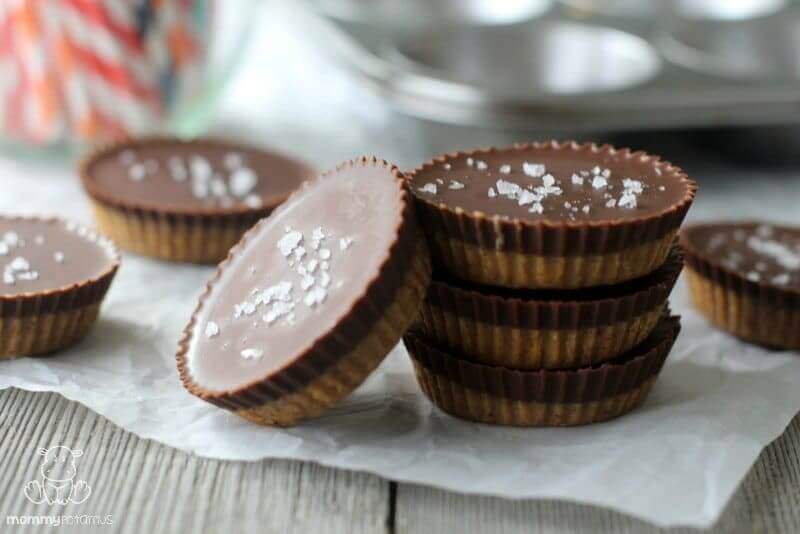 Peanut Butter cups were my favorite candy growing up. Now I can eat the “real” thing!! I’m so excited!! Made these at lunch today. 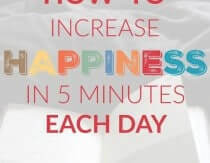 So easy peasy! Bonus–I had extra chocolate so I poured it into my jellybean mold from my jello days. Made perfect little chocolate ‘shots’. Thanks, Mommypotamus, for this amazing recipe!! Well I wasn’t asking for delivery LOL. Ya’ll are close now ! These are amazing!! I made them a lot during the summer. Thanks for the recipe! These are so good and I have so many people asking me for the recipe!!! One friend who is on a journey of losing weight and has lost about 100 pounds the old fashioned way asked about calories in each one? Any idea? I made them and then cut each one into 4 quarters!! I have no idea, so sorry! I was always a huge fan of Reese’s as well before going paleo, but i have to say… holy crap, these are good. So good, I don’t think I can trust myself to make them again anytime soon. Lol. These were a wonderful treat. I used Stevia as the sweetener and they were yummy. Thanks for sharing. Lol! So happy you liked them, Tara! Love this recipe! I modified it and made bark with a layer of almond butter and chocolate. Very delish! Added a slice of banana on the bottom layer of almond butter. Talk about a winning combination! It cuts the heaviness of the dessert, allowing you to eat more. 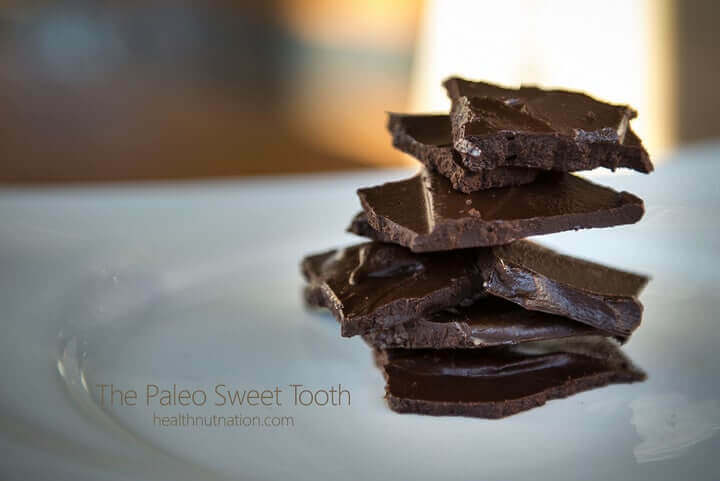 Have you ever used unsweetened baking chocolate and added some maple syrup or coconut sugar? I was just wondering how it would taste if I didn’t want any cane sugar. I may experiment this weekend! Hi Taylor! I haven’t tried it, but if you do please let us know how it turns out! These are delicious! I used homemade sunflower seed butter in place of the almond butter, honey instead of maple syrup and they were such a hit – no one knew they were eating something good for them!